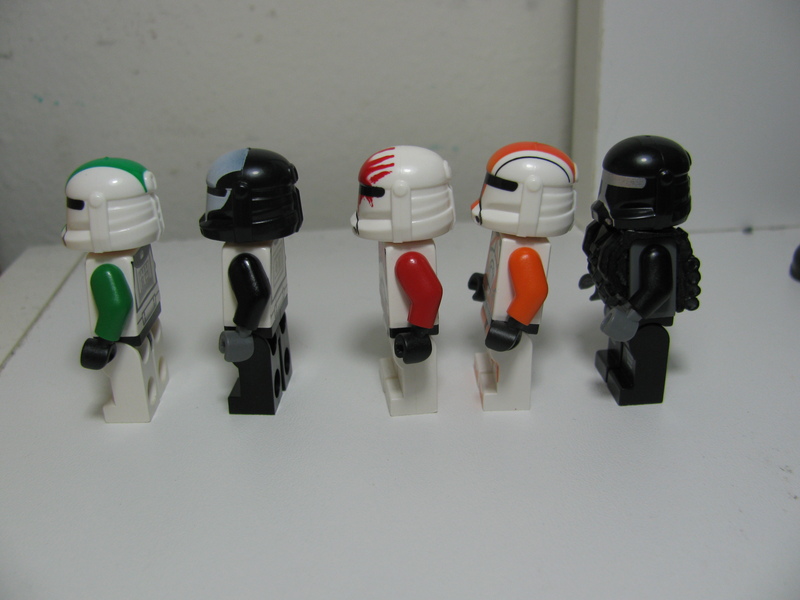 Alright, so today we have the Clone Commando Helmets. Scorch Helmet: Stormtrooper torso / Alien Conquest Legs // Fixer Helmet: Old Phase 2 Clone battle pack clone // Sev Helmet: Shock Trooper torso // Boss Helmet: Bomb Trooper torso and legs //Omega Helmet: Hazel Fantasy Emile armor with Alpha Team legs. Alright so Arealight was nice enough to send me a copy of each of the commando helmets to review; so I think I’ll go ahead and start off with the Scorch Helmet. The Scorch helmet itself is alright, but it doesn’t really match the reference work that well. The white ink used to print is a bit transparent so it isn’t a Lego white. Also, the lack of the mouth part on the lower area of the helmet is a bit of a let down for me. In my opinion had Arealight printed the helmet on a Dark bluish grey or light bluish grey helmet and done the black visor print with the white design print it would have been better. Anyways, moving on to the Fixer helmet. 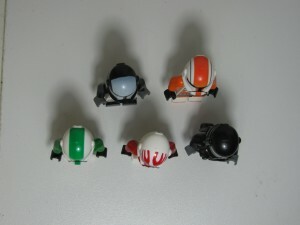 The fixer helmet has a green stripe that goes from the front to the back and a black visor. The design itself is pretty nice and it matches with the Lego green color. It does not match with the sand green in the new battle packs. I posted a picture since I think I remember seeing a few questions about the match. Next up is the Sev helmet. I’m actually glad Arealight released this as I remember right when the Fixer, boss, and scorch helmets came out everyone was asking : Where’s Sev? Anyways, Sev is a pretty well designed in my opinion. 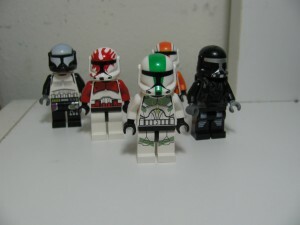 The red seems to me to be a Lego red and the design does have a bit of a smear, making it look as though the “paint” was smeared across his helmet. The design for the blood smear only goes half way though, which I believe is how it is in the games anyways. The one issue I do have is that the design sort of looks like it abruptly stops in a straight line. I think it would have been nicer if the thicker lines continued to the back and gradually got thinner. Over all, pretty good still. Moving on to the Boss Helmet. This is personally my favorite out of the five, for some reason I just like the design. The helmet has a orange stripe with two black stripes running a long side it from front to back. 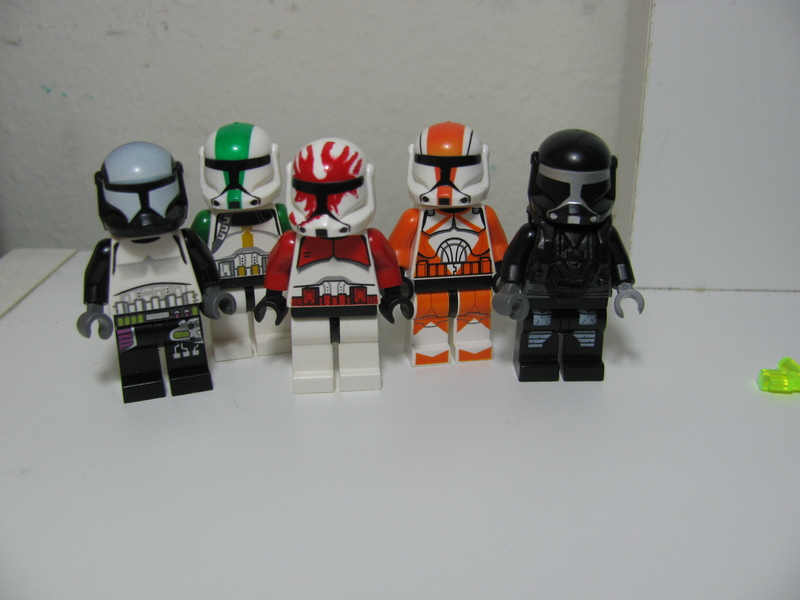 The Orange matches perfectly with Lego’s orange color and works well with the Lego Bomb Trooper body. I think out of all of them, Arealight did the best job of recreating the reference with this helmet. 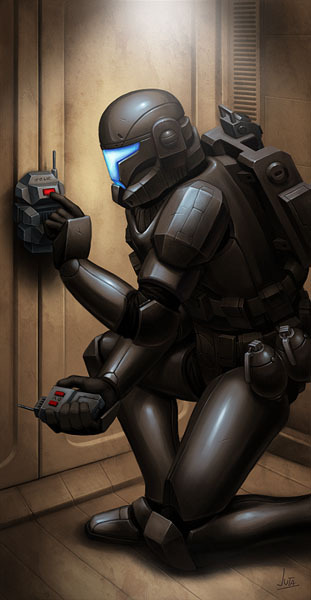 Alright, so the last Commando helmet in Arealight’s line up is the Omega Commando Helmet. I personally like this design, it’s simple and it matches the reference relatively well while still allowing it to match with a silver that Lego uses quite often. There isn’t to much to say about this since it’s such a simple design, but I think it would go well with Brickforge’s silver clone trooper decal. Also the “ears” of the helmet do not have printing on them either. Also they do not have the gradient visor like in the references, but I just see this as them not having their visor lights turned on. 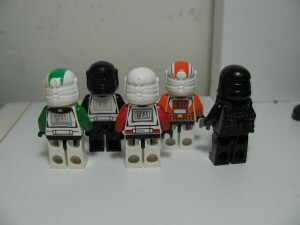 The Commando helmets are a pretty good buy if you like them, I personally recommend the Boss helmet the most; it is the easiest to source parts to make a decent looking figure with. Otherwise, the other helmets are just as good. Thank you for your time, and I hope this helped you decide on what you’d like to get. 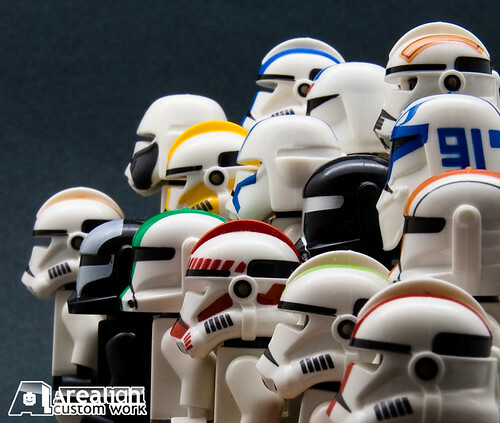 As a side note, there are one or two more reviews left depending on whether I want to do the Neyo helmets and Mandalorian helmets in one review or two. After that there may be a few other things popping up here and there. Finally we got some of printed helmets for you. It’s been a little while that we really hard working for those. And we glad to announce it will be available on Feb. 15. Hope you like the result.